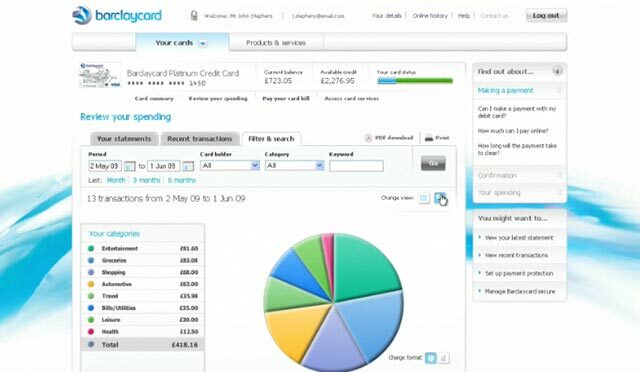 mybarclaycard is Barclaycard’s new online card account management site which launched late last year. I led the User Experience and User Interface design and development, and believe we created a unique and revolutionary site years ahead of Barclaycard’s competitors. So it is nice to see mybarclaycard being recognised, and winning awards in both the financial services and wider design communities. mybarclaycard won Best Online Initiative at the Card Awards. My favourite comment from the judges was “What everyone else ought to be doing”. Download their full summary. And mybarclaycard has been commended by Design Week; with Barclaycard the only financial services company nominated. It is only now I’ve had some space from the project and from the business, and seen the challenges prevalent in other large corporate bodies that I can appreciate just how bold and brave a project mybarclaycard was; especially for a bank. I’m proud to have been part of the creation of mybarclaycard, and hope that Barclaycard continue to enhance and develop it. I can’t help but think about how awesome a mybarclaycard iPad app could be.